It’s nearly 20 years since I married into sailing, but I still remember the bewilderment I felt when contemplating sailing logistics. How do you keep boats still on a start line? How did Ian know that a gust of wind would hit my face in exactly 5 seconds? How do you work out who’s in the lead? It all seemed like magic. Well, there are loads of books written on that, but there’s less written about the America’s Cup: what it is and what it isn’t. And the America’s Cup is really important to us right now, partly because it’s happening in San Francisco and nowhere else, but mostly because the company that Ian has invested in has sponsored a boat here. As a family, we’re living the America’s Cup. So what is it? Originally, it was a race between America and Britain, around the Isle of Wight. The rules said that the winner should determine the venue (and the rules) for the next challenge, so this year’s competition is being held in the Bay. The America’s Cup itself is a race between last year’s winner (the defender) and the best challenger. That’s it. It’s a series of one-on-one races that are either really tactical (if they’re evenly matched) or really boring (if one boat is massively faster than the other). 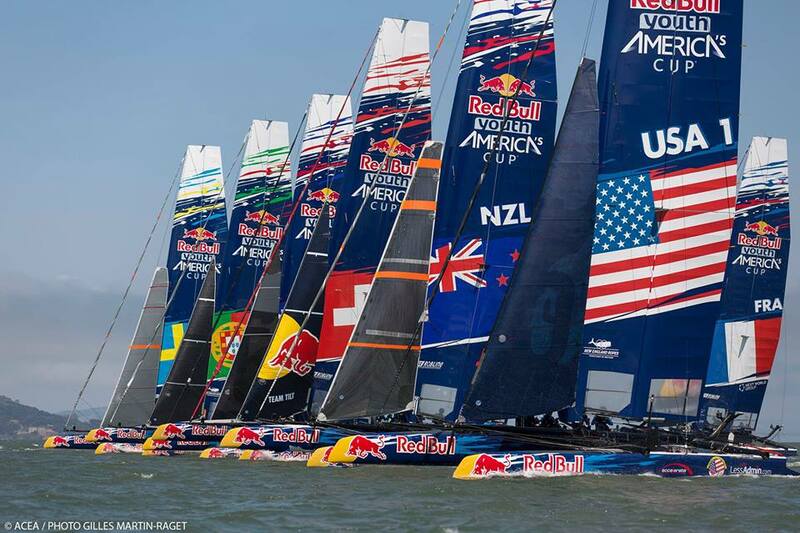 The America’s Cup started yesterday and the winner will be the team that wins the best of 17 races. This year’s best challenger was New Zealand, so it’s NZ against the last winner, USA. However, people have been talking about the America’s Cup as if it’s been happening already, even though it wasn’t. Well, it was, but it wasn’t. You see, the phrase “America’s Cup” is used not only about the challenge itself (between the last winner and this year’s challenger), but also about the whole process of determining who that challenger is going to be. 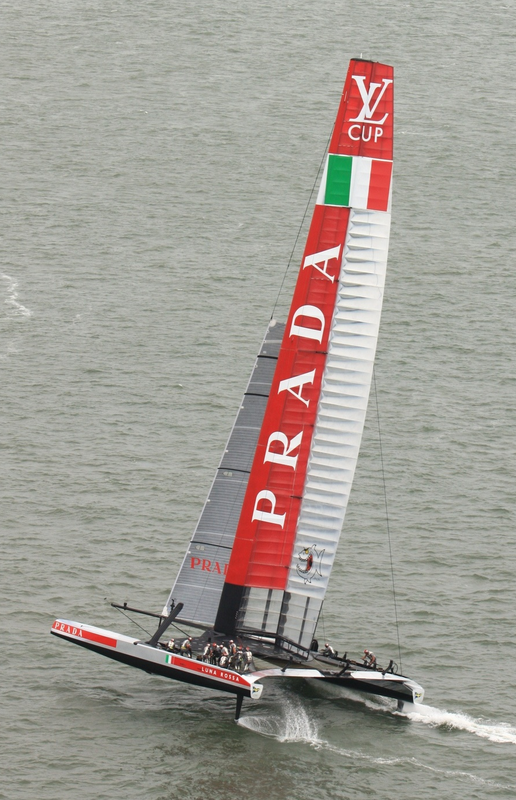 Though that process of determining the challenger is actually called the Louis Vuitton Cup. The LV Cup is a series of one-on-one races between as many teams as have the desire and funding (and they need really, really deep pockets) to have a go. It has the potential to be fascinating, but this year’s was a tragic farce. The challengers were New Zealand, Italy and Sweden. The Swedes broke a boat (and a team member, Andrew “Bart” Simpson, died) and had to cobble together a second boat. They were horribly outgunned by Italy. However, Italy was using a first generation boat, while NZ was using an upgraded, second generation boat, so Italy was horribly outgunned by New Zealand. New Zealand won the Louis Vuitton Cup easily. 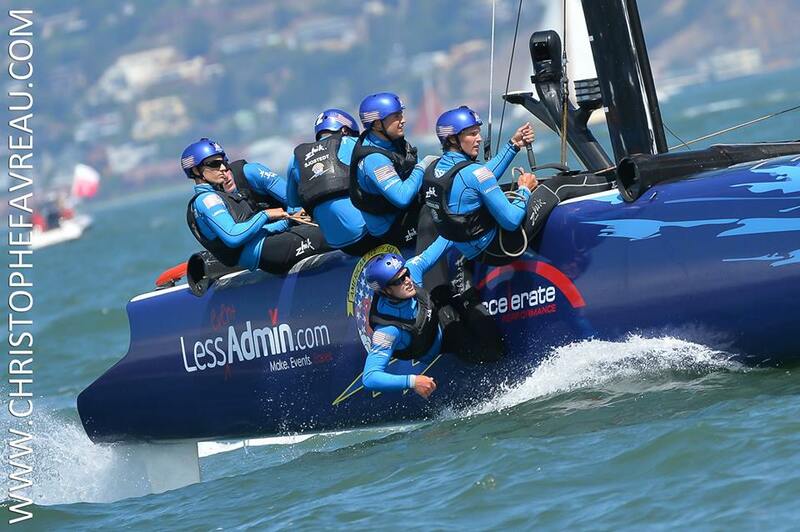 Less Admin branding looking good on the side of the San Francisco team’s boat. Photo taken by Christophe Favreau. Between the LV cup and the AC cup, there was a two week practice period. During that hiatus, ten youth teams used the smaller AC practice boats to race against each other. All ten boats were on the course at the same time and the racing was spectacular. Ian has invested in a company (Less Admin) that has sponsored the San Francisco-based team, and it’s through that sponsorship that we’ve enjoyed corporate hospitality on the water last week. This youth racing circuit is funded by Red Bull, so goes by the catchy name of Red Bull Youth America’s Cup. It’s easily shortened to “youth America’s Cup”, which makes it easy to confuse it with the real America’s Cup. And to confuse the issue even more, a New Zealand team won that youth circuit too. It’s no wonder non-sailors don’t get the hype about the America’s Cup. Just re-reading this has made my head spin. So, is Ian’s boat in the Americas cup or just the youth Americas cup? The boat that LessAdmin has sponsored is a youth boat. USA 1. The boys sailed well, but made a few silly mistakes and ended up 5th overall. But their mistakes were so spectacular that they were featured on TV and the branding was displayed.